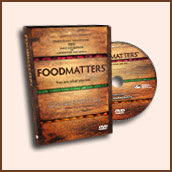 I just received my Food Matters video in the mail this week and could not wait to watch it. I ran across the trailer for this dvd on Facebook of all places and was intrigued. The basic premise of this documentary is that "you are what you eat" which we have all heard a hundred times, but I don't believe it has really sunk in for most people. So I got the girls to bed and sat down with my husband to watch it last night. I thought it was great and if you believe, like Karla and I do, that nutrition can and does influence your overall health and likelihood of disease, you will love it. The film was made up of several experts in holistic nutrition, raw eating and vitamin supplementation. They all believe that our typical western diet is the cause for many if not all of our major ailments and when I say ailments I mean the biggies like heart disease, cancer, diabetes, etc. We all know this in the back of our minds but they actually showed how cancer can be reversed - impressive. I went to bed last night inspired and motivated to study hard and learn more about holistic nutrition and to do a better job of eating myself. We really do need to eat our fruits and veggies. They can be life savers! If you are interested, I believe that you can download the film for $4.95 or purchase it for $29.95 at http://www.foodmatters.tv/index.html. To any of my local friends, I have it if you would like to borrow it! Interesting, I hadn't heard of this video. There's so much to learn about naturopathy and holistic healing. I'm a believer! First off, thanks for reading. If you haven't already, at least check out the trailer for the video. It is captiviting. The couple behind the video is from Australia and started delving into healing through food when one of their fathers was ill. I am so interested in the connection between nutrition and health too! Hi love your blog, come visit mine! Thanks Debbie, I am so glad you wrote! I started reading yours when I joined CSL a couple weeks ago. It's great! I will have to thank Kristen again! PS. HI DEBBIE! Thanks for stopping by! Hey Shannon, I'm a friend of Karla's and I'm the co-leader for a local non-profit called the Holistic Moms Network. We'd like to have a movie night sometime in January and I was wondering if we could borrow this DVD from you? Absolutely, you can borrow it! The only issue is that it is actually at Karla's right now and she is out of town so we may have to wait until she gets back if that is okay.